Suzuka, Japan, 1989. Two McLaren MP4/5’s rolled up to the first two grid slots at the Japanese Grand Prix. Ayrton Senna on pole position, Teammate Alain Prost in 2nd. Prost was 16 Points ahead of Senna in the Formula 1 World Drivers Championship, and in the penultimate race, Senna knew he had to somehow dethrone Prost. Prost knew if Senna didn’t win at Japan or Adelaide, the Championship would be his. Both knew their McLaren’s were the cars to beat in the race, and that as long as they did not take out each other, one would win. However, no one knew which one. Senna drew the better card at the start, posting a qualifying lap a second quicker than Prost. Prost had to get a better start than Senna to have the advantage for the race, and Prost did exactly that. Senna was caught out on the start, allowing Prost to have a huge advantage into Turn 1, and pushing Senna back into the battle for 3rd. Senna was able to get around both Ferrari’s as they headed into Turn 2, and he saw red. Senna overdrove the car, allowing Prost to get himself a truly awesome 6 second lead on Senna by the first pit stop. During the pit stop cycle, Prost was able to add another 2 seconds to his lead, bringing the total up to 8 seconds. There was a catch however, as Prost would soon find out. Prost, expecting to have to defend from Senna during the race, had gone with a setup with less downforce, which would allow him to protect from Senna in the two overtaking positions, in Turn 1 and coming up to the Chicane after 130R. This lower downforce setup wore Prost’s tires out quicker than Senna’s. Prost struggled on his tires, and deliberately slowed his pace to give Senna “Aero Push,” which would burn his tires off faster than the current rate Prost’s were wearing out at. Senna caught Prost on Lap 40 of 53, and launched his assault. Senna pushed all he could, put Prost kept the gap at a steady 1 second. 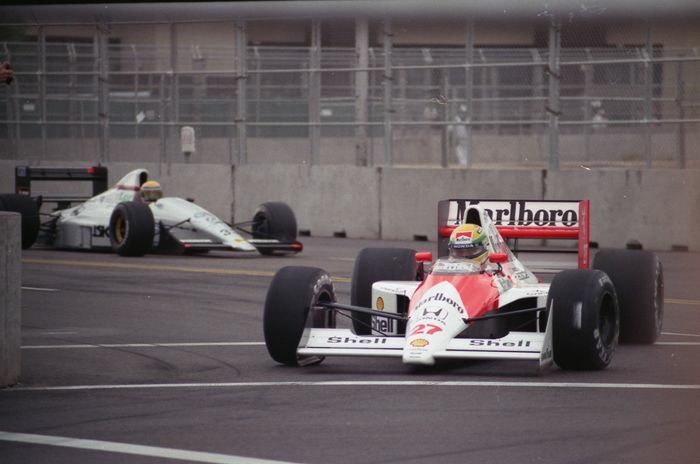 For the next 5 laps, Senna became more aggressive, running a faster time each time he passed the start finish, but Prost was doing the same, keeping Senna in his mirror. Senna began to find is rhythm after Lap 45. Senna began to use his higher downforce setup to catch Prost in the high speed corners towards the end of the track. Senna closed to less than 2 car lengths from Prost after Spoon corner on Lap 46. Senna slipstreamed up the long back straightaway. He closed in to around 2 car lengths behind going into the high-speed corner on 130R. Both cars flashed through the corner and headed towards the Chicane. Senna sensed his chance. Prost had to brake early for the corner due to the little downforce he had in the car. Senna divebombed Prost into the corner. Prost saw the white and Day-Glo orange Marlboro McLaren dart out of his mirror, and moved to defend. Both realized their mistakes too late. Prost shoved Senna onto the inside curbing, bouncing Senna’s car back into Prost’s front tire, breaking the Right-Front suspension. Both cars landed in the access road on the outside of the corner. Seemingly, the race was over for Mclaren. Prost got out of the car, as if the race was infact over. Senna, however, was signaling to the marshals. 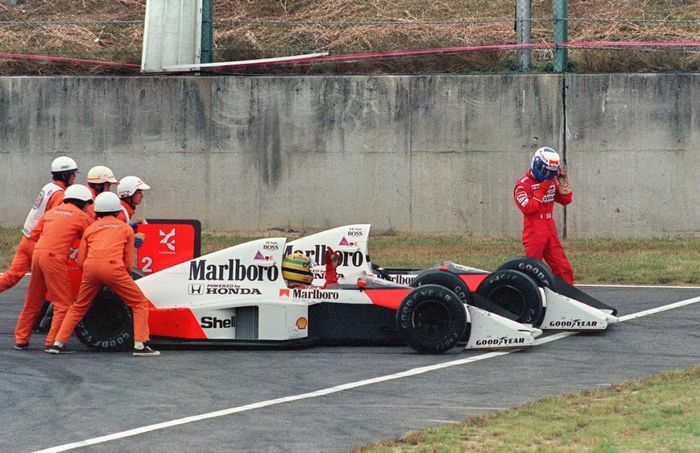 Senna had his car pulled out of the tangle with Prost’s MP4/5. Senna then charged out down the access road, weaving through tire barriers on his way back into the race. Something soon was then brought to the attention of Senna, his front wing had been broken badly, forcing him to pit from the lead, and putting Benetton’s Alessandro Nannini to the lead. Senna charged out of the pits to chase down the then leader. Unknown to Senna however, an irate Prost was charging through the garage. Not to come to the attention of doctors after the collision, but rather to file a protest against Senna. Senna was out on track, and had tracked down Nannini only 2 laps after pitting to have his front wing replaced. 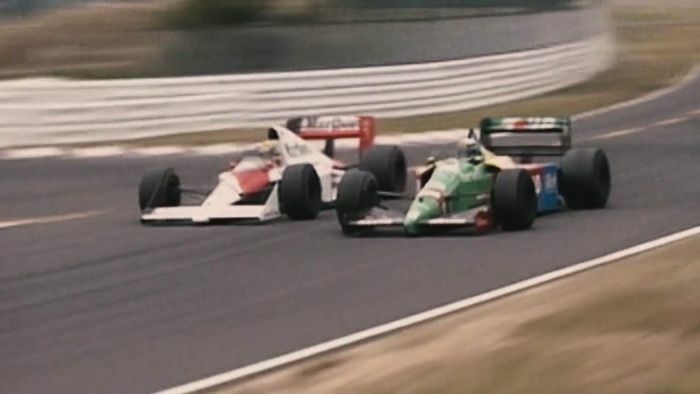 Senna made a move similar to what had been attempted on Prost, but the Benetton driver knew not to challenge Senna, allowing him past. Senna retook the lead with only 3 laps to go, and cruised to an overpowering victory over the slower Benetton and Williams that followed on the podium. No one knew this would only be for a moment. After the cooldown lap, Senna was barred from the podium ceremonies. Senna was disqualified from the race immediately afterward. The FIA cited how Senna had reentered the race circuit, by cutting through the access road and weaving through the tire barriers, rather than taking the chicane. Senna immediately stated that it was an attempt to give Prost the championship. Prost and FIA Boss at the time, Jean-Marie Balestre, were both Frenchman, and Senna believed that Balestre was trying to keep Senna from the Championship. The podium ceremonies were all but ignored, with Alessandro Nannini standing on the top step, followed by Riccardo Patrese and Thierry Boutsen. Senna and Mclaren boss Rob Dennis immediately appealed as well. 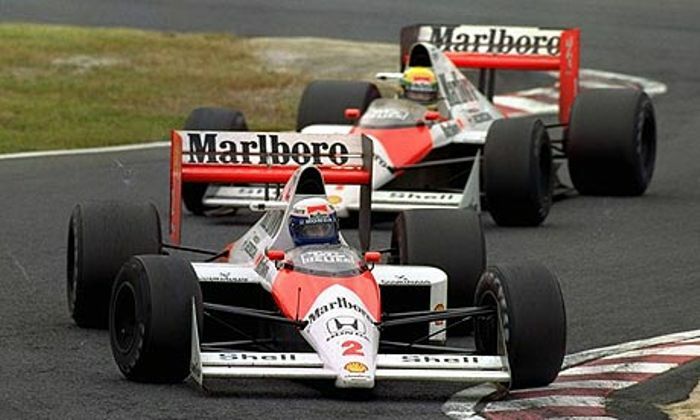 However, this was met with backlash as well, as Prost was leaving McLaren for Ferrari in 1990 and it was felt as if McLaren itself was trying to keep Prost from a World Championship. Only one thing was certain, the decision would not be made that October Sunday. Rob Dennis and the FIA both had to respond to accusations of bias throughout the week, and Senna stated that week that he saw the Japanese GP results as “temporary.” Senna had good reason to believe that their appeal would be successful, as he was the first ever driver to be penalized for a reentry such as the one the FIA was citing him for. Prost himself had cut an access road that season, at Imola. Prost had done it and gained time, however he was allowed to keep his second place finish. McLaren arrived at the FIA conference on Friday with bright spirits, but left with crushed hearts. The FIA shocked everyone, not only upholding the penalties from Japan, but also adding more to Senna’s charges. Many of the grievances that other drivers had with Senna over the season were added to the list of incidents that were taken into review. The FIA went as far to fine McLaren $100,000 US Dollars, impose a 6 Month ban on Senna, and label Senna as a “Dangerous Driver.” FIA would not have the final word, however. Ayrton Senna was absolutely irate. He felt as if the FIA had not only done an injustice to him, but also an injustice to the sport. Senna stated, “I was treated like a criminal” and that “…I was blamed for everything.” Rob Dennis threatened to go further with the case, telling the media, “…there will be a few heads, even prestigious ones, that will risk a fall.” Alas, there was still the Australian GP to be run. The World Championship was still not decided when F1 rolled into Adelaide the next weekend. Senna knew if he won this race, he could still be declared World Champion. 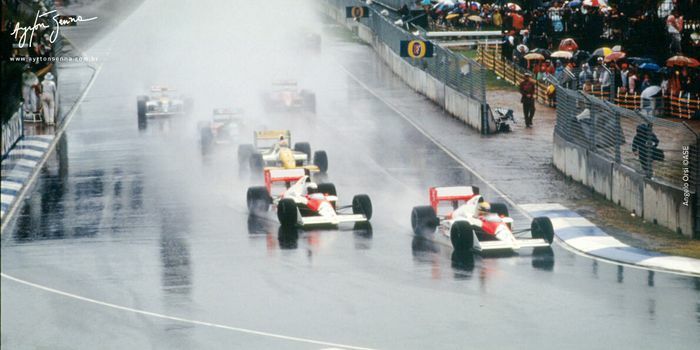 The race started in the extreme wet conditions and Alain Prost had again bested Senna on the start, but Senna got the best of Prost going into Turn 1, and Senna gained the lead without Prost putting up a fight. Senna pulled away at a blistering pace, holding a 9 second lead. 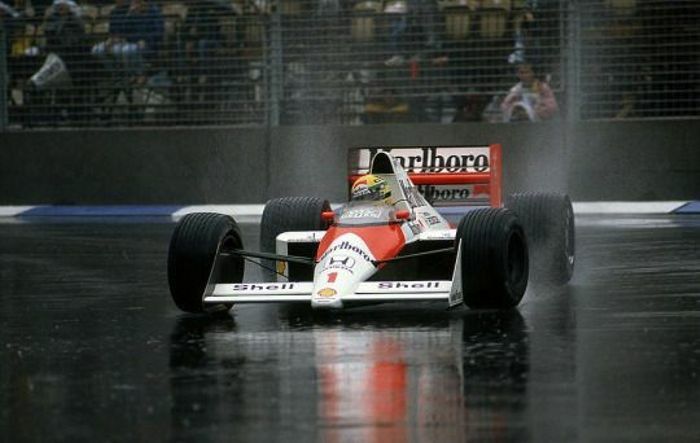 Senna drove as fast as he could in the wet, but Senna pushed too hard. He spun out 4 times on Lap 13 before hitting Martin Brundle’s Brabham. Senna pulled into the pits without a right front wheel, where he retired. The World Championship fight was over, and Prost had won, but the Japanese Grand Prix was not over quite yet. Even after his defeat in Adelaide, Senna was still determined to fight the hefty penalties that were placed upon him at the Friday conference. Senna still held the belief that the penalty at Japan was a “…true manipulation of the Championship.” and that even though he did not win at Adelaide, but if he had the Championship for Prost would have been staged by the FIA. Balestre became furious at Senna, stating that if he wanted to regain his F1 Superlicense for 1990, he would have to issue a public apology. Senna inclined, with his Superlicense being issued for 1990 without any protest. 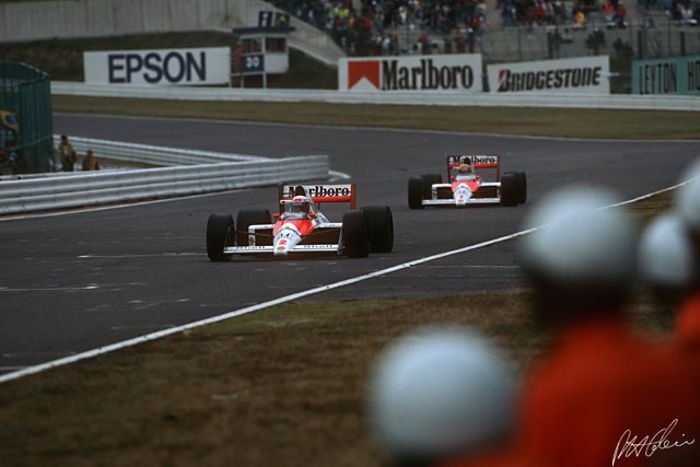 The 1989 Japanese GP could finally be put to rest. Talk still circulated around the Senna/Prost incident at Japan for years after the crash. Most criticism was thrown at Balestre’s handling of the incident. In 1991, when Balestre stepped down as FIA President. Max Mosley, the new FIA President, stated that Balestre “…had no understanding of the separation of power.” and that Balestre “…fixed the whole thing.” also citing that he influenced the race stewards in Japan to give the penalty to Senna. Senna would ultimately get his revenge in the 1990 Japanese Grand Prix however, taking out Prost in the first corner to win the World Championship, his second out of his eventual 3 World Championships. 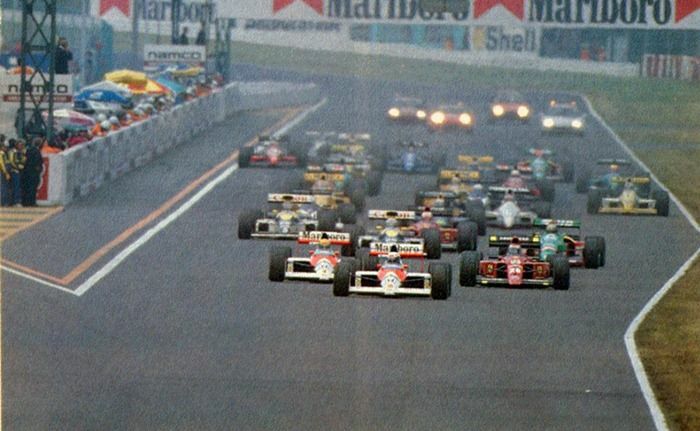 No matter what happened afterward, the 1989 Japanese Grand Prix is still the most debated Formula 1 race of all time.